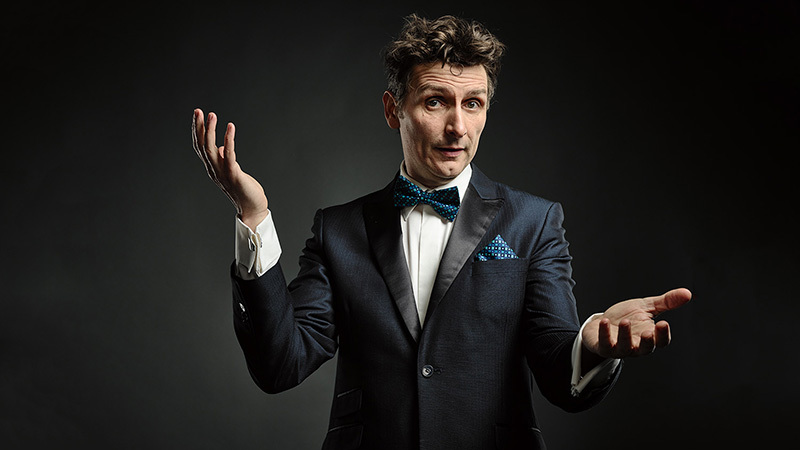 After 20 years in the much loved, Perrier Award-winning duo Lano and Woodley, Frank said Good Bye to being one half of a double act in 2006 with a national tour that took in 34 markets and sold more than 125,000 tickets. Since hanging up his hat, Frank has been busier than a bee (bees are allegedly flat out). His smash hit solo show Possessed played across Australia and the Edinburgh Festival with packed houses and rave reviews. In addition, his animated short, Chicken of God, received an AFI nomination and he won the coveted Herald Angel Award at the Edinburgh Fringe for his role of Candide in the Malthouse Theatre production of Optimism. Frank was also a regular guest on ABC TV’s music quiz show Spicks and Specks and Network TEN’s Good News Week and an audience favourite on Thank God You’re Here. 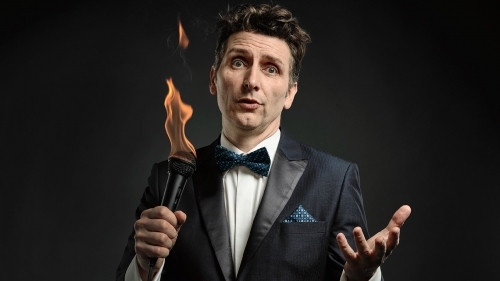 Australia’s most visually compelling comedian was never far from the stage – doing live stand up in the unique song singing, limb flinging Woodley way. It was no surprise that Frank’s 2010 solo tour, Bewilderbeest, quickly sold out around the country, firmly cementing him as one of Australia’s most-loved comedians. 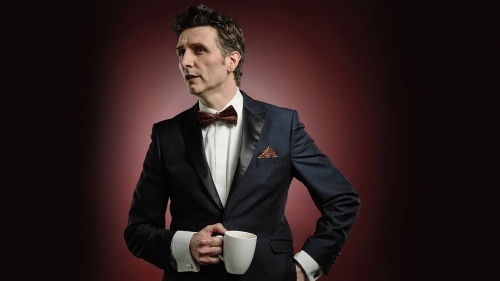 In 2012, Frank was back on stage with his new show Bemusement Park. 2012 also saw the much anticipated debut of Woodley on ABC TV. Created by, written, produced and starring Frank as the title character opposite Justine Clarke and newcomer Alexandra Cashmere, Woodley is a romantic comedy filled with virtuosic physical mayhem. 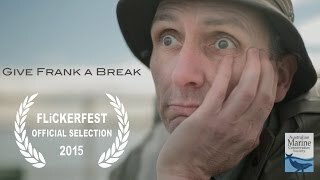 It also resulted in Frank receiving an AACTA nomination for Best Performance in a Television Comedy. Frank then premiered Inside – another new, daring stage show, this time alongside Simon Yates from acclaimed physical troupe, acrobat. This Kafkaesque piece put the two clowns in prison and premiered at the 2013 Sydney Festival before touring to Adelaide and Melbourne. 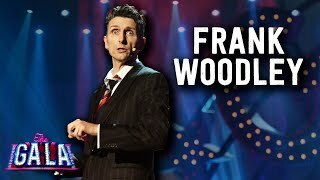 In 2014 Frank returned to his Woodley way with a new show, Fool’s Gold, performing at Adelaide Fringe, Darwin Festival, Brisbane and Sydney Comedy Festivals, and of course the Melbourne International Comedy Festival. He also starred against type as the Dog Catcher in family film Oddball, stretched his musical legs in his collaboration with Harvest Rain (playing Sir Robin in Monty Python’s Spamalot at QPAC) and as the Inspector in Lemony Snicket’s The Composer Is Dead at the Sydney Opera House, the Melbourne Recital Centre, and the 2016 Adelaide Cabaret Festival. Frank’s recent exciting foray – into children’s fiction – via Penguin Books hit the shelves in July 2015, with more to come. The first two books in the Kizmet series can be found in all good book stores around Australia.2016 has seen Frank tour not one, but TWO new shows – Noodlenut for the kids and Extra Ordinary for adults. Something for everyone who loves Woodley’s special brand of nonsense-genius. Various clients including Qantas, Colgate-Palmolive, KPMG, Collingwood Football Club, Cream Advertising Awards, the Financial Planning Association, the National Associated Retail Traders of Australia and Targa Tasmania, BMW, Honda, KPMG, STA Travel, Adelaide Zoo, Collingwood Football Club.